GRAVITY FEED: THERE ARE TWO WATER CHAMBERS INSIDE THE UNIT. THE TOP CHAMBER IS POURED INTO AND HOLDS 2 GALLONS OF WATER. IT FLOWS INTO A LOWER CHAMBER WHERE THE WATER IS HEATED. A FLOAT SWITCH IN THE TOP CHAMBER TURNS THE UNIT OFF WHEN EMPTY UNTIL IT IS FILLED WITH WATER. EACH CHAMBER HOLDS 2 GALLONS TOTALING 4 GALLONS. YOU MUST REFILL THE TOP CHAMBER EACH TIME THE UNIT SHUTS OFF. EACH 16 OZ POWDER PACK MAKES 16-6 OZ CUPS OF CAPPUCCINO. EVERY 2 GALLON REFILL MAKES 40-6OZ CUPS. 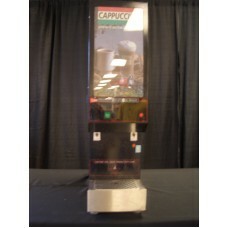 THE PRODUCT HOPPER INSIDE THE FRONT PANEL OF THE UNIT HOLDS 8 1LB-PACKAGES OF POWDER AND MAKES 128-6OZ CUPS,REQUIRING 6 GALLONS OR 3 REFILLS WATER. THIS MACHINE REQUIRES A DEDICATED 120 VOLT 20 AMP CIRCUIT TO OPERATE PROPERLY, MEANING, NO OTHER DEVISES SHARING THE SAME CIRCUIT!!!!! CLEAN THIS UNIT AFTER EACH DAY AND BEFORE RETURNING TO TAYLOR RENTAL.